For breakfast I highly recommend La Creperia Café in Tampa. The charming atmosphere mimics bistros in France and Italy. From the La Parisienna Sandwiches on their menu, the croque madame is my absolute favorite. It’s an open-faced sandwich with gooey cheese, savory ham and is topped with an egg. For a great midday meal I love the Oxford Exchange in Tampa. My first pick here every time are the fried brussels sprouts served with a lemon vinaigrette, shaved ricotta and smoked sea salt. The outdoor seating is so peaceful with the sound of the fountain. 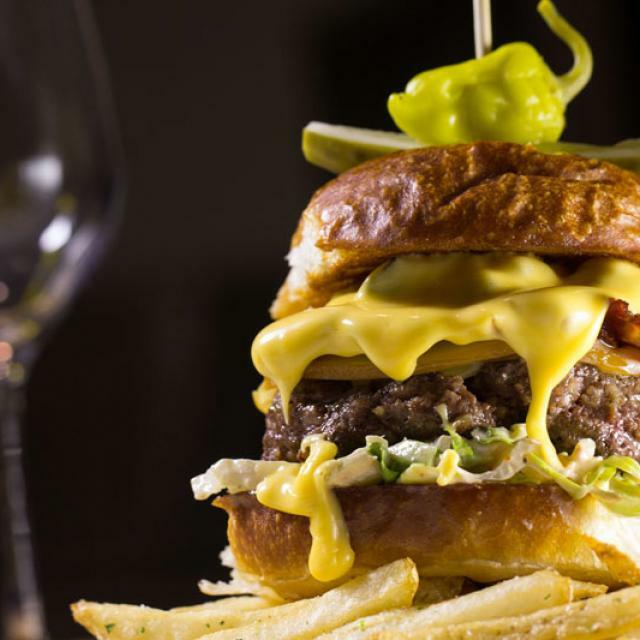 If it is a burger you crave you must try The LOCALE Market in St. Petersburg where you will find the best farmer and artisanal producers. The aptly named St. Petersburger will be sure to please with local dry-aged beef, bacon, gouda cheese, mouth-watering caramelized onions and sautéed mushrooms, special sauces and romaine lettuce all on a fresh house brioche bun. Yum! For pizza night my family has several favorites and one is Pizzeria Gregario in Safety Harbor. 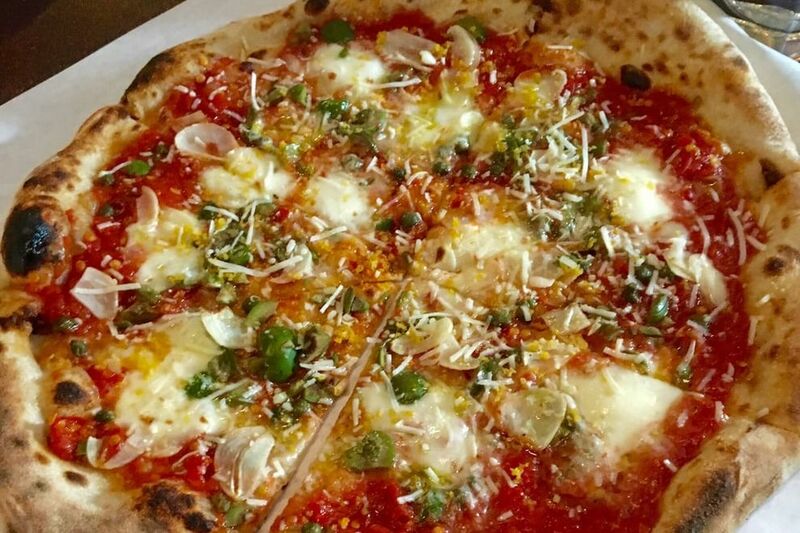 You cannot go wrong when they serve only fresh, local ingredients prepared in a wood fired pizza oven. Feel free to ask Greg, the owner and chef, to recommend the very best pizza dish to satisfy your cravings. For a laid back and casual experience go check out Datz in Tampa for the ultimate comfort food. The Barry C’s Stuffed Meatloaf (as seen on travel channel) is literally a flavor explosion in your mouth! The meatloaf is stuffed with bacon-jalapeno mac n cheese, topped with a ketchup glaze, and served alongside house mashed potatoes, peas and pearl onions. I always love my seafood and Frenchy’s is my first pick when I want a tasty grouper sandwich and I absolutely love their sheep crab soup; it is truly amazing! You cannot pick wrong between the five locations they have throughout the bay area but my favorite has always been French’s Saltwater Café in Clearwater. 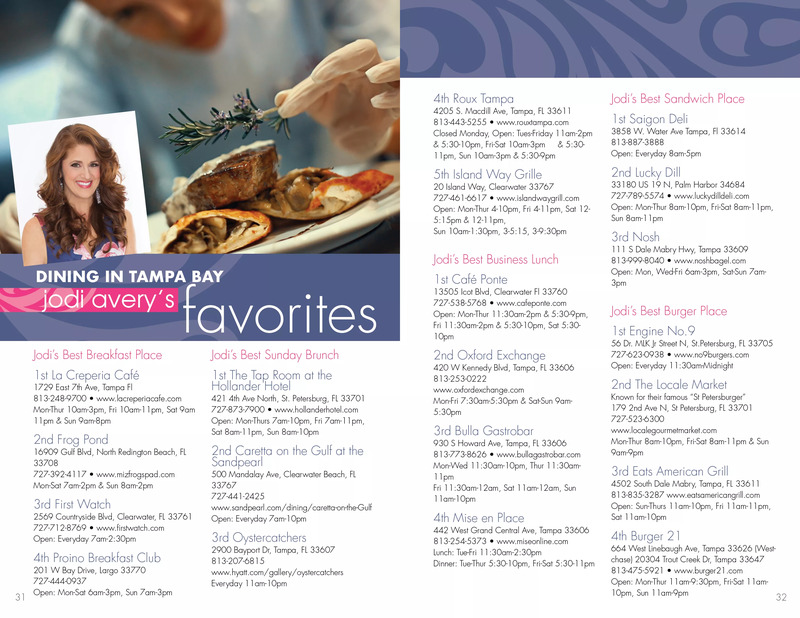 From pasta and pizza to salads and one of the most delectable dessert menus around, try Bavaro’s in St. Petersburg. They have the most incredible Italian coffee dessert called affogato that is a perfect end to any meal. I love Cuban sandwiches and the Columbia is number one in my book for one of the best Cuban’s around. Not only do they have great Cuban sandwich, but their signature “1905” salad with garlic dressing is tossed tableside and is incredible. The salad is named for the year the restaurant was founded in Tampa’s Latin district of Ybor City. And if you are thinking about a romantic date night, think no further, Ciro’s Speakeasy in Tampa is where to go. You will be transported back in time with the atmosphere. My choice on the menu is the 60-spice scallops and the melt in your mouth Fernet and Coke Strawberry Shortcake with lavender whipped cream, macerated strawberries plus coke-soaked lady fingers. For more of my favorite dining places log into my website at www.jodiavery.com and click on my A-list. You will find not only dining places, but things to do with your kids and my best-of-the-best providers in the Tampa Bay area. I would love for you drop me a line to let me know what you think after you try any of my recommendations. 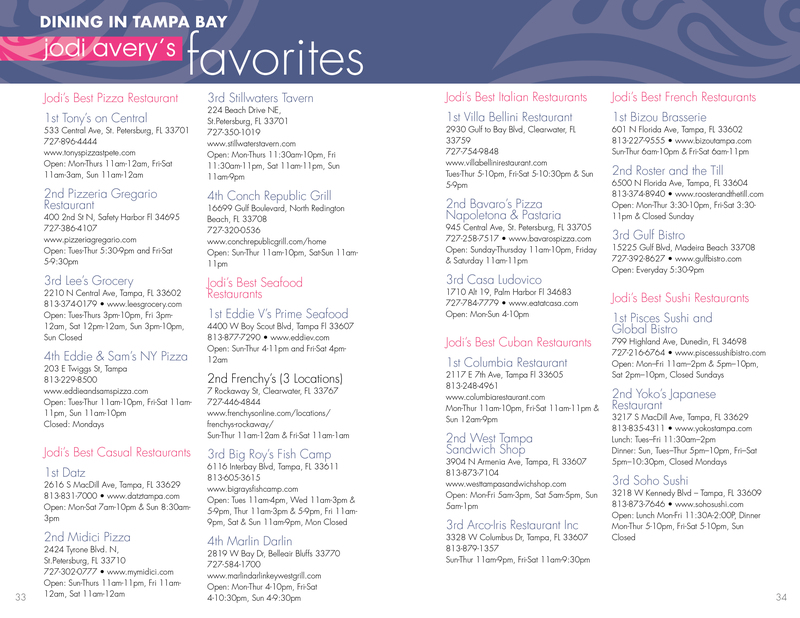 If you have a restaurant not listed that is amazing, let me know! 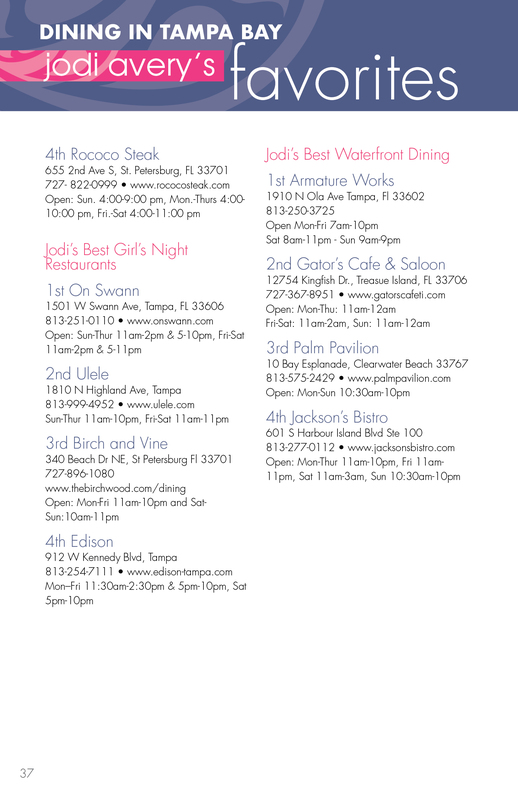 Remember if you or a friend are looking to buy or sell please call me at 727.238.9660 or email me at jodi@jodiavery.com. If you need a referral for a reliable service provider, ask or check out Jodi’s A-list on my website.